Blizzard has sent closed beta invitations to everyone who opted in before December 16, but the open beta will not begin until sometime in 2014. The open beta for free-to-play collectible card game Hearthstone: Heroes of Warcraft will not arrive until sometime in 2014, announced Blizzard yesterday. The delay was not entirely unexpected. At BlizzCon in November, chief creative officer Rob Pardo announced that the game should be in open beta by December, though he added, "But in Blizzard language, that might mean January." Blizzard also announced that as of December 19, beta invitations have been sent to everyone who opted in to the Hearthstone closed beta before December 16. Opt-ins for the closed beta test will end on January 7, 2014. You can opt-in here with a Battle.net account. In the announcement post on Battle.net, production director Jason Chayes explains that the latest update for Hearthstone included some major code changes. The latest card changes, the new Ranked Play system, and on-going work on server stability have contributed to pushing back the open beta. Chaves writes, "The development team has been working hard to get this out before the end of the year, but our highest priority is that Hearthstone has an awesome launch when all gates are lifted and everyone can download it and play at the same time." If you opted-in to the beta but can't find your invitation even after checking spam folders, Chaves says not to worry. "We're putting together a list of all Battle.net accounts that opted in to the Hearthstone beta test and did not claim their beta key," writes Chaves. "These accounts will be flagged for beta access within the first few weeks of January." Everyone who opts-in to the beta test before January 7 will be invited to the closed beta before the open beta begins. Hearthstone: Heroes of Warcraft launched closed beta testing in August. The Escapist previewed the game in October and called it "a fun distraction that will keep you entertained for hours on end." 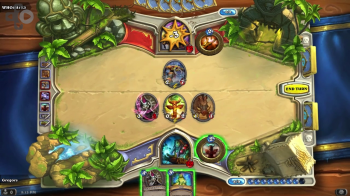 Hearthstone will first be released for PC and Mac. Versions for iOS and Android devices will arrive sometime in the second half of 2014.